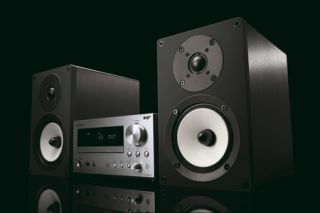 Onkyo CR-555DAB micro hi-fi comes with or without speakers, in silver or black | What Hi-Fi? This just in from Onkyo: it has released details of its new CR-555DAB micro hi-fi system, fitted with a DAB/DAB+/FM radio, CD player and iPod dock. It will go on sale in August in two versions (in black or silver): without speakers at £250, or with a pair of D-055 speakers included (price to be confirmed). Additional features include a USB port for connecting flash-memory devices, a 96kHz/24-bit optical or coaxial digital input for sending hi-res music files to the receiver's own 192kHz/24-bit DAC, and a dedicated subwoofer preout. Onkyo says the CR-555DAB incorporates the same three-stage amplification technology used in the company's home cinema receivers and hi-fi separates to reduce distortion and "preserve the natural character of the recording". The optional D-055 speakers employ N-OMF (New Onkyo Micro Fibre) cones made from moulded layers of aramid and lightweight, non-woven cotton.